Experience the thrill and pure adrenaline of off-road quad biking with Hanmer Springs Attractions! A fantastic way to explore the gorgeous Hanmer Springs region with a healthy dose of exhilaration and a whole bunch of fun. This awesome tour will see you exploring a range of exciting Canterbury terrains uncovering the gorgeous scenery of Hanmer Springs along the way! This exciting and safe tour is expertly lead by our friendly and experienced guides, and is perfect for all levels of riders! 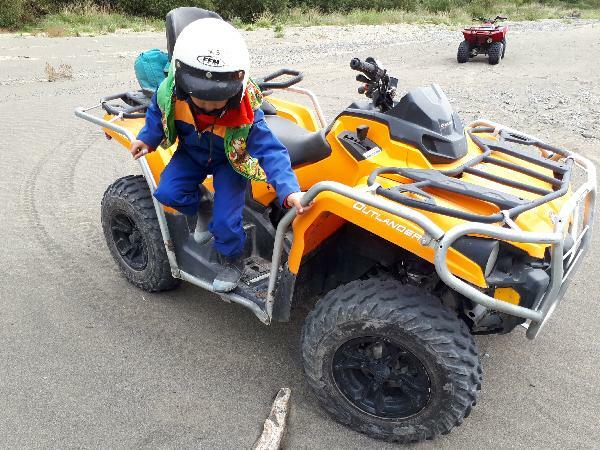 Our Quads are of the highest safety standards and are super easy to get the hang of - you’ll be a pro in no time! Great fun for all ages - this will be the New Zealand adventure you will never forget! Our Quad Bike tours depart from our river base on Hanmer Springs Road (State Highway 7A). Find us on the right, just before the bridge, after the turnoff to the township from State Highway 7. The minimum age for quad biking is 6 years (as a passenger) and 12 years (to ride solo). Ride on the double seats bike with my 7 years old son sitting at the back comfortably. It's an well chose route with great view and various terrains, suitable for beginners or kids. The guide is very friendly. 2 hours is good length of time too. The photos taken by the guide are okay but not really worth $35 in my opnion, purchased anyway. So one thing I would recommend to.improve for the activity is that if the guide can equip more professional camera and then to take better photos for their customers. Because there are some fantastic opportunities for great photos such as crossing river. Thank you for you review Kun Gu, We are glad you enjoyed your quad bike tour with us! And we appreciate your feedback on our photos, we will take this on board and discuss with our guides the best option in the future! We look forward to seeing you again! Cheers! Great Guides and even better experience! It was a great experience from the start. The tour guides were super friendly and helpful. Great for a chat and history of the area. Was very intimate and the guides made sure we had a great time and they also took some great photos. Highly recommend doing this if you visit Hanmer Springs, views were amazing. This is a lot of fun. Relaxed, humorous but very competent guides. Instructions clear and effective, long enough to ensure competence but short enough to be soon off on the trip. Bikes easy to ride, even for novices, and protective clothing and gumboots provided. Stunning mountain backdrop to a great ride. Loved every minute of this tour. They were really professional & was really welcoming. My partner & I roughly enjoyed this tour & would highly recommend for anyone wanting to get out & explore. Thank you once again! Great trip. My 16 year old son loved it. Your message has been sent to Quad Bike Tour - 2 Hours - HANMER SPRINGS . You should hear from them shortly. Please note: all responses will come directly from Quad Bike Tour - 2 Hours - HANMER SPRINGS , and not the team at Bookme.